Rice is a staple in almost everyone’s pantry so I’ve created this easy Tomato and Bacon Risotto for anyone who wants a nutritious meal on the table and not wait for hours. It was another nice day here in Ste Anne and I needed to cook something hearty and quick for supper. Both boys are now in Football until first week of November and they need something filling but not too heavy. Risotto is perfect before the kids go to practice and packed with flavourful herbs, vegetables and a light sauce. With so many rice dishes available today in convenience packets I hope my recipe motivates you to get in the kitchen and try something new that is homemade. Don’t be afraid of the word risotto, it’s just a name and you too can cook this delicious Tomato and Bacon risotto just like I have done. This easy risotto recipe will be on your kitchen table in just under an hour. Risotto is typically made with an Italian rice called “Arborio Rice” cooked in a broth to a creamy consistency. Making risotto is one the main ways rice is served in Italy and you can use just about any type of stock. Some people add wine and butter as well to give the risotto a flavour boost. You can add pretty much anything to a risotto from chicken and prawns to one of our favourites bacon and tomato. Tomatoes are in season right now and picked straight from the garden. These juicy sweet tomatoes just add even more flavour to the risotto dish. My herbs are also plentiful and any chance I get they are into almost every dish I make whether it be a salad or a stew some sort of herb is added. In this dish I have Basil, Chives, Thyme, and Sage which is an excellent flavour boost to this dish. Don’t be shy to add any kind of herbs you fancy as it doesn’t really have to be these. A good way to experiment is to try risotto using different flavours and spices each time you make it. Finally some freshly picked spring onions which you call in Canada, salad onions. They are still quite small but are a perfect for this risotto dish. Delicate but powerful these don’t overpower the risotto like normal white or red onions may. They best part is left until last! Let’s not forget the bacon because everything is better with bacon. I use bacon bits which I get from my butcher with are the leftover ends cut up and frozen into large blocks. I usually pick up one for around $7.99 which I then divide up and put into the freezer ready to just add into any dish. One usually lasts around 5-6 months so it’s well worth the price. Risotto is easy to make but still takes time and lots of love. With the right amount of stock and plenty of flavours get ready to transform boring rice into something creamy and special that your family will love. Then add bacon and cook for 5 mins. Add rice and stir in the pan ensuring the oil and the bacon coat the rice completely. 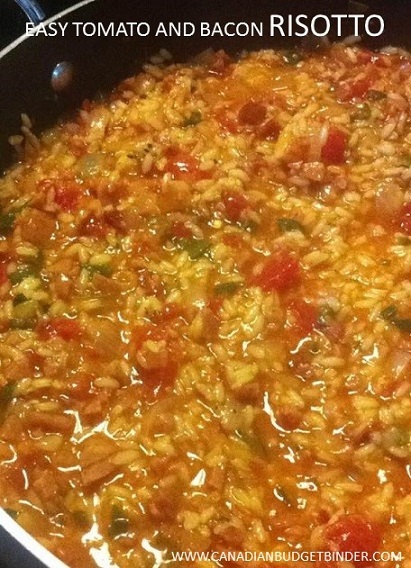 When the rice has been completely coated in the oil and bacon add the chopped tomatoes and pepper then stir. Be careful not to let it burn to the bottom of the pan. Now add the stock a cup at a time ensuring that in between each addition the rice soaks up a lot of the liquid. This helps the rice soak in all the juices. When the last of the liquid is added add in the herbs and the spring onions. Turn the heat down to a simmer, then add the butter.This will give it the creamy texture.Keep stirring rice so it doesn't stick. If it is sticking add a small amount of water. Now if after 40 minutes the rice still has a slight bite to it, add a small amount of water (1/4 cup) let it absorb until soft. This can and often happens to arborio rice so you may have to do this a couple of times. Just have extra water on standby. The rice should have soaked almost all the juices and you should be left with a creamy sauce texture but without the cream! There you have it a one pan risotto dish that’s healthy without the cream but filling enough to satisfy even before you hit the gym! The best part is this risotto will be done in less than an hour! 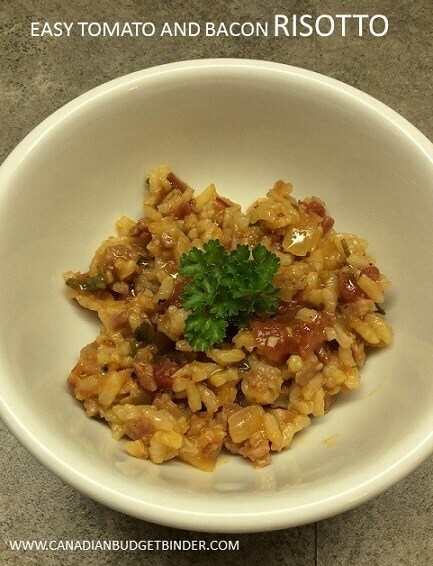 Nicola, just this morning, my wife prepared this easy tomato and bacon risotto, which I also brought to work. I shared this with my colleagues, who happened to like it so much. I gave them a copy of the recipe and one of my friends is trying this out, which she’ll be bringing tomorrow. I am so excited to taste her version of this bacon risotto. Thanks for the recipe.